Greetings crafty friends. Today I am here with one more post for the Coffee Lovers Blog Hop. #2017SpringCLH. I have had so much fun this week with this hop and making all these projects. Today's project was made with a stacking teacup die set, paper from a Lily of the Valley paper pad from 2014, and a sentiment from Viva Las Vegas Stamps that came in a grab bag purchase in 2014. The tea cups I colored using Recollections Watercolor Markers. Such a gorgeous card!!! Beautiful colors and sentiment!!! Oh my, Mimi...these soft muted pastels are GORGEOUS! Thanks for sharing this one. LOVE LOVE LOVE it! 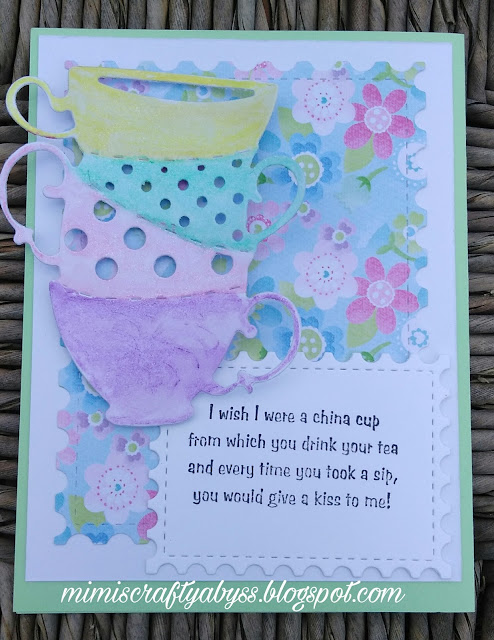 Love the pretty stacked teacups on that pastel paper! So Pretty! How sweet is this?! Love those stacking tea cups! Just love this and that sentiment is adorable. Love the pastels, love the sentiment, love this pretty card! Your sentiment is so darling and those colors on your cups and background are fantastic! This is so pretty, your color choices are perfect.